Dave Zaitlin created this hybrid in about 1991. It was registered in 1993. The seed parent was Sinningia kautskyi and the pollen parent was Sinningia schiffneri. The influence of the schiffneri parent can clearly be seen in the grooves in the bottom of the flower. The flowers are quite similar to those of the pollen parent. The corolla lobes are white and the throat has lots of small dots. There is no trace of the purple which dominates the corolla of the seed parent, Sinningia kautskyi. The plant's habit, however, does not much resemble that of Sinningia schiffneri, being compact and compressed. 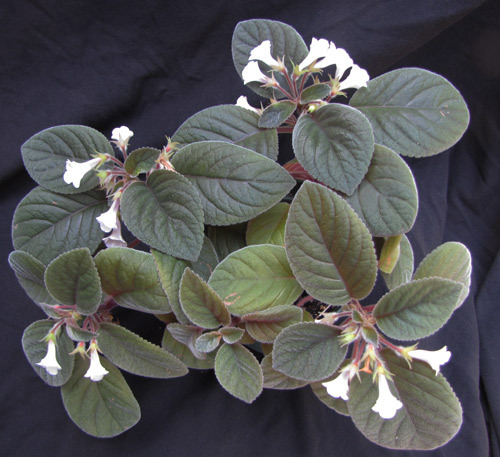 However, as can be seen in the photo below, of the same plant, but from the back, the stems do get bare with age, like those of the Sinningia schiffneri parent. 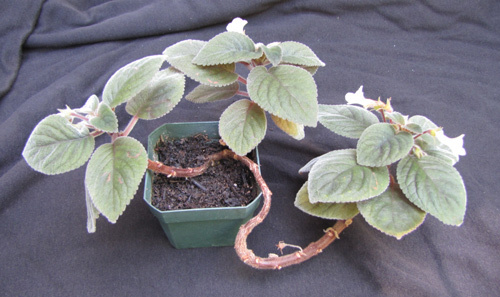 However again, this picture, taken in August 2013, shows the plant after transfer to a larger pot combined with more consistent watering. Here is one set of flowers. Finally, we have a nectary shot, showing that the hybrid has structure in common with its Thamnoligeria clade parent, namely Sinningia schiffneri. Incidentally, the spelling 'Carnaval' is correct. English is almost the only language to spell carnival with i as the middle vowel. Portuguese and French and Russian have a, German and Italian and Swedish have e. Portuguese is the operative language here, since the two species parents and the festival the hybrid is named after are all Brazilian. 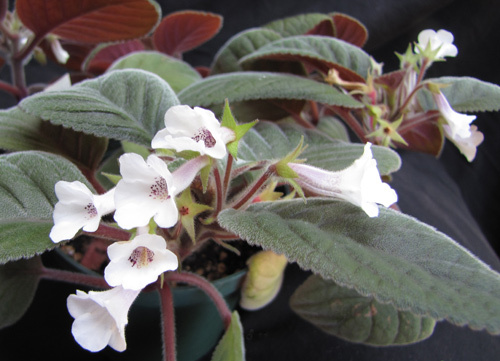 Sinningia 'Carnaval' has the gesneriad family's typical pair-flowered cyme. This one has two open flowers and two buds. 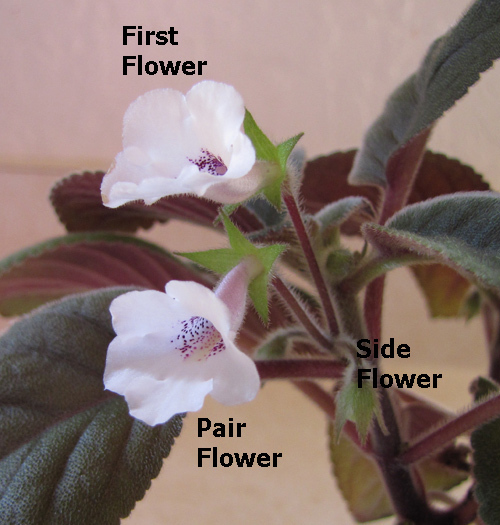 Here the first flower, pair flower below it, and one of the side flowers of the cyme are marked. The other side flower is on the opposite side of the inflorescence from the marked side flower. Leaves Gray-green and slightly fuzzy on top, red on the bottom. Inflorescence axillary cyme of 1-4 flowers, peduncle shorter than 1 cm. 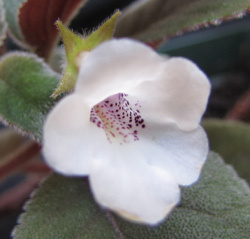 Season Mine bloomed for the first time in October 2011. It is blooming in August 2013. Hardiness No information yet [August 2013]. One parent (S. schiffneri) can survive a night freeze. The other parent (S. kautskyi) probably can't. 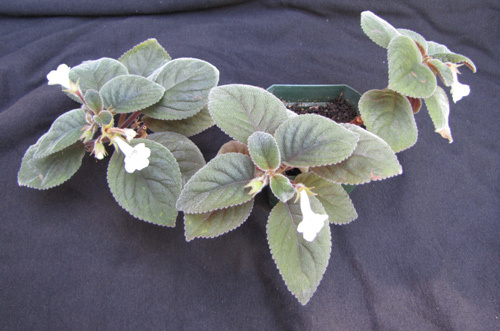 Update: In December 2013, an outdoor plant of 'Carnaval' has survived freezing temperatures. Recommended? Yes. 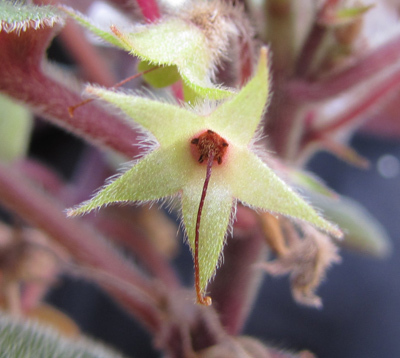 The plant is compact and attractive. Plenty of water in a good-sized pot will create a fine display of flowers in late summer or early autumn. Fertility Almost certainly not fertile. Dale Martens reports she was unable to use this hybrid as a parent. Taxonomic group Sinningia kautskyi is in the Sinningia clade, while Sinningia schiffneri is in the distant Thamnoligeria clade, so it should not be fertile unless it is tetraploid.